Hello my dears! I hope you're enjoying your week! It's still chilly here in SoCal and I've been trying to keep myself and LO warm. I made little leg warmers for LO out of an old pair of knee highs that I had lying around, and it seems to be doing a good job of keeping her ankles warm. She's been learning to walk, and with all her tumbles, her pants have a tendency to ride up. I love the way the leg warmers turned out and I bought some more knee highs for her, in bright fun colors. I had my trigger finger ready for the last Enchanted restock and managed to pick up the monthly release holos. I have to admit that I was super impressed with the formulas of both polishes compared to previous releases. Both were super pigmented and nearly opaque in one coat, with formulas smooth as buttah. First is October 2013, a dark charcoal grey holo. I missed the OPI My Private Jet original holo and I've always been on a lookout for a good dupe. This one hit the spot for me, it was nice and dark without looking too silver from the holo pigment. The flare is strong when in direct light - this is complete perfection! One coat here with no topcoat in these pics, with the first in the light tent and the rest under direct light. Next I have November 2013, a red holo than leans towards a rust shade. I've been lemming a nice red holo and this one is a good fit. I used two thin coats here for good measure and no topcoat in these pics. First one again is the light tent, the rest are under direct light. Another perfect holo flare here. DH got me some Cheeky plates from my Amazon wishlist for Hanukkah and for shiggles I thought this would be the perfect opportunity to try it out. I chose what I thought was a snowflake pattern but I think it's more of a map/compass related pattern instead. In any case, I got to practice my stamping technique and it seems like I did ok, although the image on my thumb was crooked. I need to work on my aim! I think this print managed to not overwhelm the holo flare like it can sometimes do when it's a print heavy pattern. From afar I think it can pass as a snowflake pattern. I want to try to incorporate some holiday themed manis so this will have to do! Hopefully it will get me into the holiday spirit - are you getting ready for the holidays? 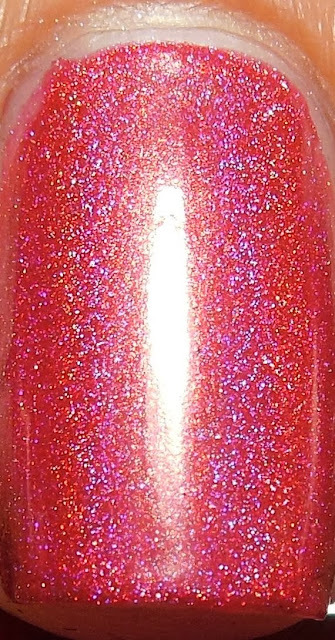 How cute is that stamp over the red holo?! It makes my eyes happy, beautiful job!